There are many solutions that are proposed to the increasing levels of congestion within the central areas within the city and around the city. Though there are a few rumblings of how it is essential to make sure that all transport is integrated into a single system. Many different systems are being proposed and the bus will continue to have a vitally important role even if every new system does come into place (refer Appendix B. Importance of connectivity). This section will go into each of the transport solutions that are proposed and BMTC responses that are required in order to ensure that they effectively tackle the transport problems that exist within the city. It is beyond the scope of this report to go into a comparison of financial viability of the various modes of transport that are proposed. However, we will attempt to outline a simple cost benefit analysis based on historical experiences in other cities. 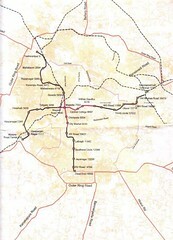 The Metro Railway has been designed to alleviate the congestion in the central part of the city. It is under implementation by the Bangalore Metro Railway Corporation like the sister concern: the Delhi Metro Railway Corporation. Initially, it is proposed to have two lines totalling 33km with some part of it being underground and most of it being overground. The total investment for a North-South line and an East West line was in the range of Rs. 5,000 crores. The advantage of a Metro railway is that it can carry upto 57,000 passenger per hour during peak hours. It therefore is a Mass Rapid Transit (MRT) system. In addition, it is a clean and comfortable mode of transport, which is supposed to transport people at speeds of upto 60kmph. The high cost of implementation of the Metro Railway is the main argument against it. Historically, there are very few (if any) Metro Railway systems that can operate without some form of state support. In Singapore, the capital cost of construction for the Metro was waived when operations started, in Hong Kong the investment in property subsidises the loss making railway business while in most of Europe there is direct state support to keep the metro railways running. In addition, most metro railway systems are put in place before the creation of urban sprawl the way it has happened in Bangalore. This allows for growth to take place along the railways lines unlike what is proposed where the railway is ‘inserted’ into an already congested city. Given this reality, the requirement then would be to ensure that the Metro railway is well connected to other modes of transport. Even after the Metro Railway is formed, connectivity to it will continue to be crucial in ensuring that people have access to the system. The task force calls for an alignment of the Metro Railway so that existing bus terminuses like SBT, Malleswaram Bus Terminus and Indira Nagar depot are integrated seamlessly with the Metro. The Commuter Railway system aims to use the existing rail infrastructure to provide a mass rapid transit option using the existing railway tracks. It will however involve some investment, mostly to lay additional tracks alongside the existing ones and signalling with expenses for the purchase of locomotives and coaches. The direction of the commuter railway is similar to that of the Metro Railways with it being separated by a distance of around one kilometre from the other at most points. Creating a CRS is a fairly inexpensive method to leverage existing infrastructure to service the needs of the commuting public. The total cost of the commuter railways is documented to be in the range of Rs.1,200 crore. However, like with the Metro Railway connectivity remains the single most important factor to ensure that it can help alleviate commuter comfort. The task force calls for a commencement of negotiation with Indian Railways to ensure that all existing train stations allow access to BMTC buses where possible to pick up passengers as a matter of routine. This could include special areas in the Bangalore Cantonment Railway Station as the creation of one ways have moved the bus stop away from immediately outside the station. In addition, it calls for the beginning of services to all railway stations where it is feasible like Hebbal, Malleswaram, Banswadi and Byappanahalli among other train stations. The Task Force have accepted the need for a more comprehensive and better public transport model. The Bus plays a crucial role in this model as it provides connectivity to the last mile even for those using the railway system: be it the commuter railway or the metro railway. The bus system must be tightly integrated with the MRT system and where possible should function like an MRT. The existing model of bus transport is a destination oriented bus system, with the city having three hubs in KRM, SBT and KBS. As highlighted earlier in this report, it has functioned well while the city still had three distinct city centres. The present system can continue to operate and be profitable but it is unlikely to increase commuter market share much beyond 50% due to the growing decentralisation of the city. The under-capacity of the system would remain at the present level but would increase in absolute numbers. Therefore, there would be an increase in the number of two wheelers, SUV’s, taxis and auto-rickshaws. Public Transport is unlikely to be a preferred mode of transport if it does not provide access to all areas based on a system of buses. Modifications to this destination oriented model were also proposed through the identification of key points on the periphery of the city. All the key points would be connected to every other key point through a system of buses while feeder services would service the areas beyond or from the key points. This involves the creation of a multiple hub and spoke model, which is more effective than what is at present but concern remains on some issues on this model. It is proposed that it be studied and incorporated into a future bus system where possible. The grid system of buses is one that aims to fix some of the weaknesses of a destination oriented bus system as being followed currently. 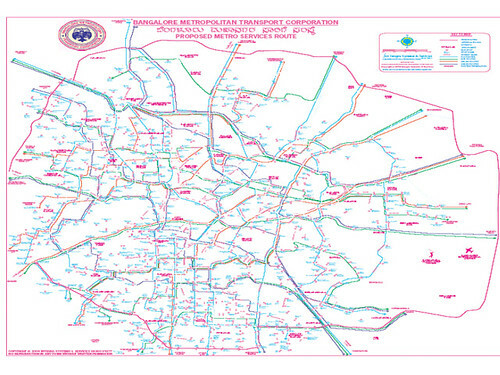 The first proposal to launch a grid system of buses came from the BMTC itself. 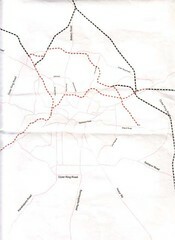 In the report ‘Metro Bus Concept for Bangalore City, Revised Approach’ twenty-seven routes are outlined in a grid system. A detailed discussion on the benefits of the grid system is given in Section 5. Details of the system, the logic of operation, the logistics and other details are outlined in further section. currently no higher resolution image available. The following example is to highlight the importance of having a reasonably priced alternative transport system. Without a cheap transport system, it will be difficult to take people away from the two wheeler (now called Public ka Naya Transport). The example given above illustrates how important it is for the BMTC to remain competitive. Therefore, an individual who earns Rs. 5,000 per month and calculates his total economic costs of using the bus service, would find it beneficial to buy and use a two-wheeler instead of a bus.